In a grassy field in Banff National Park in Alberta, Canada, a mother Bighorn Sheep stays within a close range of her lamb. Until the lamb reaches about 4-6 months old, it will survive on its mother's milk but during these months, it will also learn how to graze on grass and shrubs. The mother will wean her lamb around the six month mark but it will stay with the mother's band for the first two years. If the lamb is a male, it will leave its mother after two years but the female will stay with the same group for life. 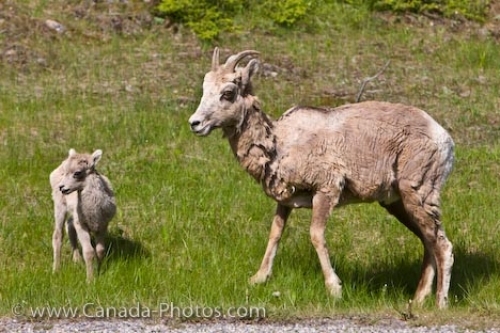 Bighorn sheep and lamb, Ovis canadensis, along the Lake Minnewanka Loop Road, Banff National Park, Alberta, Canada. Picture of a mother Bighorn Sheep with her lamb in the wilderness of Banff National Park in Alberta, Canada.